A hostage situation was resolved in Denver, Colorado on Monday morning after police there responded to calls that a gunman had barricaded himself and at least one other inside a 7-11 convenience store. Reports began to trickle in shortly after 9 a.m. local time on Monday morning suggesting that an unidentified gunman had taken a woman hostage at the store and was threatening to shoot her. Thirty minute later, the Denver Police Department described the ordeal as a “possible hostage situation” and had deployed negotiators to the scene. Eyewitnesses reported a loud “blast” shortly after, and within minutes the police tweeted that the suspect had been taken into custody. The unnamed suspect was shot, the police confirmed, and is in critical condition. Authorities told Denver’s 7News that he attempted to use the female hostage as a human shield, but she was not hurt. A neighboring McDonald’s fast-food restaurant was evacuated as a precaution, local network 9-News reported, and a local ABC affiliate said that four area schools were placed on modified lockdown. 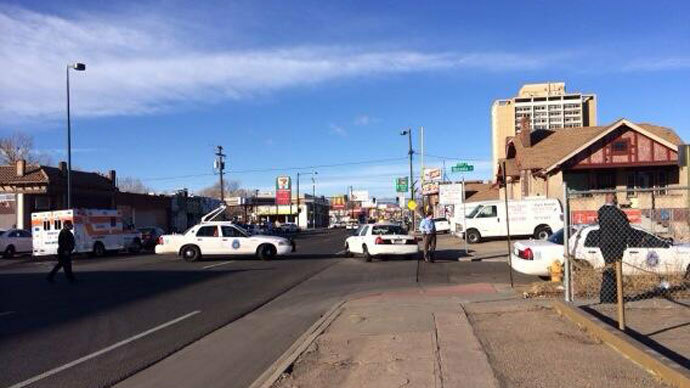 #BREAKING Update: Suspect in possible hostage situation at Colfax & Perry in custody.